With mini-camps wrapping up across the continent, the next big event in the 2017 CFL calendar is the Draft. On May 7th, (most of) the best and brightest Canadian football talent will be snapped up by the league’s nine teams over eight rounds. Although the Redblacks could go many different routes with the last pick in the first round, selecting Behar makes a lot of sense. It fills a need – Ottawa has suspect depth behind Brad Sinopoli – and adds another local product to the team’s receiving corps. Behar is a London, Ontario native but, of course, played college ball in Ottawa. 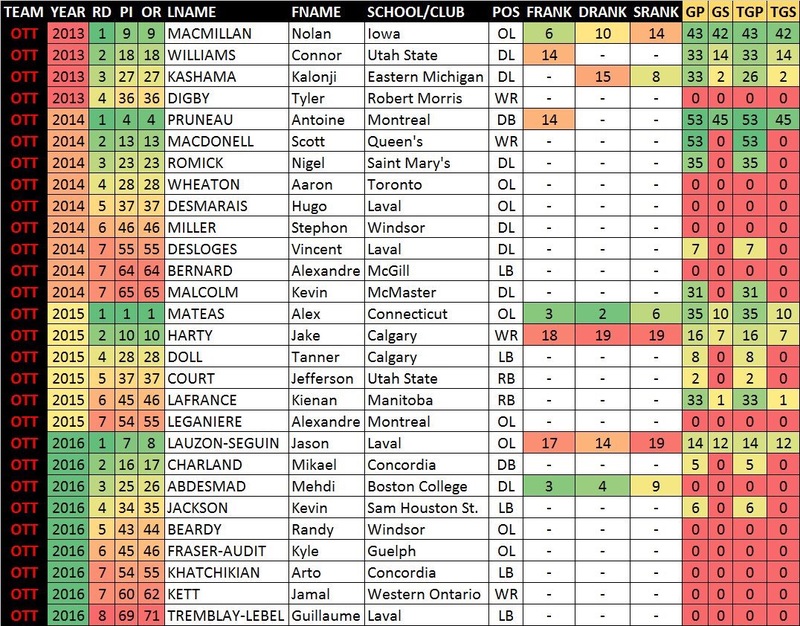 The Redblacks could use another offensive lineman – McGill’s Qadr Spooner will be considered – as well as a defensive tackle, however a DT such as Idaho’s Faith Ekakitie or Montreal’s Junior Luke would be a reach in the first round. Behar’s local ties edge out Spooner. Herdman’s fall to the bottom of the first round has much to do with both his NFL interest and his testing results. Although NFL teams will be grossly turned off by his 5.16 40-yard dash, the combination of his Senior Bowl performance and his game tape – that of which suggests no issues with his testing numbers – should result in Herdman getting an opportunity down south as an undrafted free agent. For Ottawa, while a plethora of defensive tackles and offensive linemen remain available, they saw strong seasons from Connor Williams and Ettore Lattanzio in 2016, while Zack Evans has became a menace in the middle. Based on the players still available versus Ottawa’s team needs, they’re in a position to invest in a player like Herdman. Regardless of his testing numbers, Herdman will one day be a starting inside linebacker in this league. Herdman has subsequently been invited to Kansas City Chiefs rookie mini-camp. NFL interest isn’t the only thing muddying Ankou’s stock. At 6-foot-3, 325 pounds, the worry is he’s a bit oversized for a typical CFL interior lineman, but on the plus side, he’s not viewed as strictly a one-dimensional run-stuffer. The RedBlacks would likely love an offensive lineman, but this Ottawa native might be the best talent on the board. Note that Ankou was subsequently signed to a priority free agent contract by the Houston Texans immediately following the NFL Draft. This will likely make him a late round CFL selection, given the likelihood he wouldn’t come to the CFL for a minimum of 1-2 years, if at all. Roy put up an outstanding 39 bench press reps at the combine at just 287 pounds — an outstanding feat for a guy who could afford to add weight to his 6’3 frame. Roy’s also bilingual, an added bonus for a bilingual market. Of all my picks in the first round, this is the one I’m most hesitant about. Last year, Marcel Desjardins and his REDBLACKS staff took an NCAA defensive lineman in Boston College alum and Montreal native Mehdi Abdesmad in hopes he would come to the CFL sooner rather than later. Abdesmad has not yet come back north which could interest Ottawa in stretching for another big name quarterback hunter in Iowa Hawkeyes Faith Ekakitie — OR could push the REDBLACKS towards taking a USPORTS player ready to commit himself to the organization immediately. Maybe even a Kwaku Boateng or Kay Okafor if they last to the end of the first round. There is a chance the Bombers make this pick at #6 but if they don’t, Ottawa will add the solid route runner who will add depth to the receiving corps. Mitch Picton isn’t ready to start yet but the Redblacks don’t need him to. Picton is a tremendous receiving talent who can learn behind Brad Sinopoli and eventually replace him, providing currently absent depth in the slot. Like I said, pretty varied. Note that Justin Senior (1) was selected by the Seattle Seahawks in the 6th round of the NFL Draft, while Ankou (Houston), Geoff Gray (Green Bay) and Antony Auclair (Tampa Bay) were all signed to priority free agent deals immediately after the draft. All four will likely drop to mid-round picks, given the risk of them ever playing in the CFL. Also worth noting that LB Cameron Judge (UCLA) and DL Randy Colling (Gannon University) have been ruled eligible for the 2017 CFL Draft. Both could very well be selected in the first 2-3 rounds. The 2017 CFL Draft is Sunday, May 7th @ 7:00PM ET. The first two hours will be broadcast live on TSN.